The onslaught of real-time social data means that, as marketers, we now live in a world of "presentism" where everything is real-time, always-on, pervasive, and constant. We can no longer predict the future because it's already happening—right now. To thrive in this new world, your traditional processes and supporting tools have to change. You need integrated team structures and streamlined processes that help you get your messages to the right audience in real time. 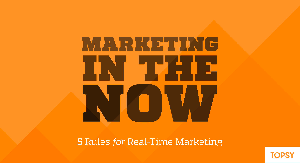 Get started with these 5 rules for real-time marketing.